i once read this story about and old man who spent his last days wondering about a particular question. if he could be just one thing in life, what would he choose it to be. when he couldn’t figure out the answer he started asking the members of his family the same question. his 40 year old son, who was married and struggling to support his family, answered “rich”. his son’s wife, who didn’t care much for being rich, but worried about her children making the right choices, she answered “wise”. his 25 year old daughter, who was single and lonely, answered “loved”. the boy was quite for a while then stopped looked up at the old man and said, “found”. 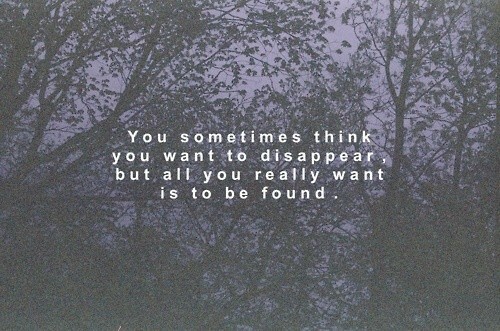 when i read this i thought it was extremely insightful, cause the truth is we all want to be found. whether its by a job that we love, or a person who loves us; someone who understands us. we all want to be seen, to be heard; found.